Future Slot Machine are Coming – With the gambling industry anxious to attract younger players, some slot machine makers are looking to challenge the generation raised on video games. Players in the United Kingdom will soon get a chance to make real wagers after sinking a battleship, knocking a character off a perch, or playing a word worth a triple-word score. In Mexico City, Merkur Gaming is testing a slot machine that has players sit inside a cozy, futuristic-looking orb much like sensory heavy arcade video games. It’s all part of a push to offer more skill-based, social games to attract younger players while retaining more traditional games for women in their 50s and 60s — the most lucrative players. For them, the allure of slot machines has been simple. Pull the handle or press a button, hear lots of noise and watch excitedly as the reels come to a stop, often so close to a big win that players can’t wait to try again. That’s not enough for a younger generation that grew up on fast-paced video games. The industry is looking to attract them with games similar to ones they’re already used to playing. At a recent convention of casino game makers in Las Vegas, Edvard Toth, studio head for California-based Gamblit Gaming, sat in front of a four-sided touch-screen table showing how a flick of his finger could launch a virtual slingshot sending a puppy clad in a police uniform flying toward a zombie cat. “This is a slot machine that doesn’t look like a slot machine,” he said. The company strategy aims to appeal to players 21 to 45 who will recognize the games it wants to bring to U.S. casinos — Lucky Words (think Scrabble), Police Pooches (like Angry Birds), Dreadnaught (like Battleship) and Raze (think Risk). 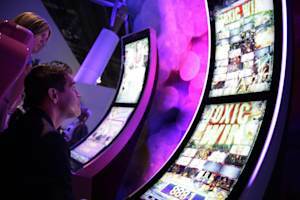 All were on display at the annual G2E Global Gaming Expo. To meet regulatory rules, the new titles must be as much a game of chance as a traditional slot machine — a requirement that makes it difficult to design a game that includes an element of skill. In the case of Gamblit games, mastering one of the more skilled challenges doesn’t win a bet but instead triggers the spin of a reel or wheel, or a roll of dice for a chance at real money. Slot machine makers have tried to insert skilled games into traditional slot machines before, Toth said. But it’s akin to sticking a slot machine inside the classic video game “Call of Duty” and expecting his grandmother to like it, he said. Gamblit is cleared to offer its games in the United Kingdom, where real money will eventually be wagered. The company is licensed in Nevada but will still need regulators to sign off on the technical side of its games once if it gets a U.S. casino order. 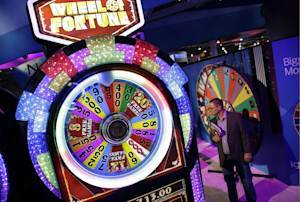 Traditional slot machine makers don’t necessarily see a young gamer when they design new games. Jean Venneman, vice president of product licensing for Bally Technologies, sees 52-year-old women as the most coveted players. “I try to find things that are classic and current,” she said. 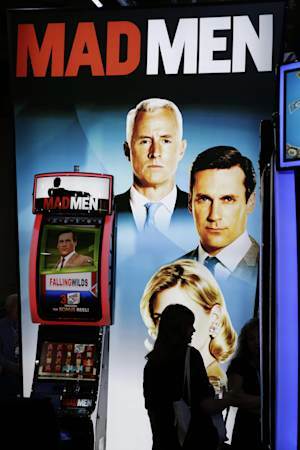 With that in mind, makers of more traditional slot machines are offering models with themes incorporating reality TV shows, 1970s superheroes and 1990s sitcom characters. “We were a little concerned at first that the show was too dated,” Venneman said of “Wonder Woman.” But the footage was spruced up and she said the resurgence of superhero popularity has led her to believe it will be a hit with her target audience. Joey Sanchez, slot manager for the Northern Edge tribal casino in New Mexico, gave Bally’s “Duck Dynasty” game a try at the expo. He said he’s still genuinely surprised when he sees who is playing the 750 slots at his tribe’s casino. “You’re trying to please everybody,” he said.